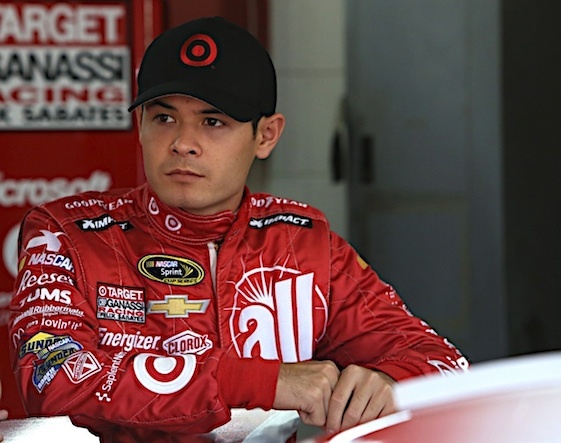 LOUDON, N.H. – Kyle Larson doesn’t want anybody to think of him as arrogant or boastful. Let’s just call him confident. And the 21-year-old NASCAR Sprint Cup rookie is getting the kind of results on the track that prove he can get the job done, even if he is a bit impatient for more. In his first full season in Cup, Larson made a strong run at earning a spot in the Chase for the Championship, although he came up a bit short. Heading into Sunday’s Sylvania 300 at New Hampshire Motor Speedway, the youngster is 17th in the season points and has posted 12 top 10s in 27 starts. “If I could have done things right, we could have two wins this season,’’ Larson said Friday before the first practice session on the Magic Mile. “I think it’s coming. I hope it’s before the end of the year. Larson’s success is not much of a surprise. Despite his youth, he came to Cup this year almost as heralded as current starts like Jeff Gordon and Tony Stewart, who like Larson race sprint cars with great success in their formative years. And those guys are among his biggest fans. It certainly hasn’t hurt Larson’s reputation as a racer that he is constantly running with the leaders, no matter where he races. Last week at Chicagoland Speedway, Larson wound up finishing third after some struggles during the race. “The more you run up front with those guys, the more you learn from them,’’ he said. “I don’t know if there is a particular thing I’ve learned, but I’m sure there are other situations that are similar to how it was last weekend or any time you run up front. A big lesson for Larson has been learning to communicate with his Chip Ganassi Racing crew. “I think (what has) made a difference for running well the whole race is understanding how I want the car to feel at the end of happy hour (practice),’’ Larson said. “In the first half of the season or so and the first half of last year in the Nationwide season, I would always try and get the car looser and looser so I could go faster. Then you start the race and you are way too loose. Although failing to make the Chase was a disappointment to Larson, there is at least one benefit to racing the rest of the season without the pressure of a championship battle. “Since we didn’t make the Chase, I think you can work on 2015 stuff a little bit more,’’ Larson explained. “(Teammate) Jamie (McMurray) and I have been fast all year long. We just didn’t get the win that we needed before the Chase started. One thing the youngster definitely doesn’t need to work on is confidence. I wonder if Kyle Larson will have an easier time than Joey Logano, since Kyle was 21 before he Cup raced. Joey first went the distance and won at 22. Maybe Kyle Larson will be a winner at 22. Btw, Joey, Trevor Bayne and Kyle L. were apparently all Gordon fans as kids. Joey said he liked Mark Martin and Jeff Gordon as a kid and Trevor says he was a Gordon fan as a kid in Knoxville. Kyle wore a Gordon jacket one the first day of first grade.